LOS ANGELES—Quietly revealing that it had happened on a similar cloudy fall night, Dodgers second baseman Chase Utley reportedly freaked out his teammates before Game 3 of the World Series Friday evening with a spooky story of a home run ball that was never found. 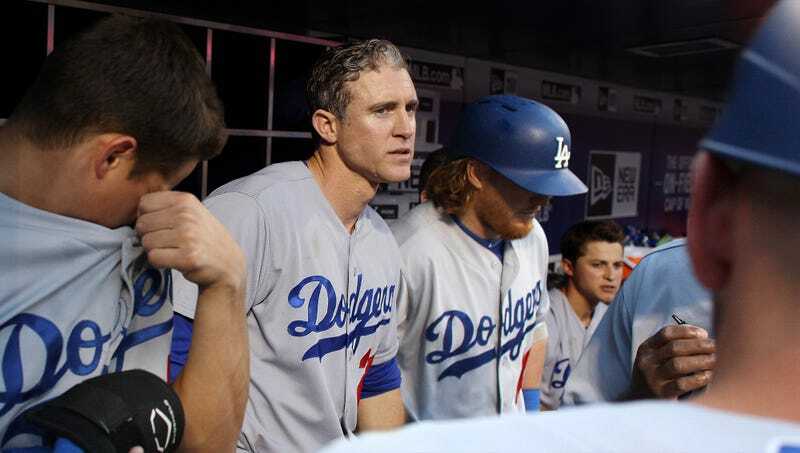 “Listen, all, to this old tale of a home run ball that was hit out of the park and never, ever heard from again,” said Utley, holding a flashlight under his face as his teammates slowly gathered around him, huddling under blankets in the dark, silent Dodger Stadium dugout. “Some say it comes in the night for overly aggressive batters who chase pitches outside the strike zone, others say it still haunts the upper mezzanine to this day. If you go up there on a quiet night, you might hear the sound of it slowly rolling in search of a fan to finally catch it.” At press time, the entire team had reportedly gasped and gone silent at the sound of something rolling across the dugout roof.